Get in touch with nature at Pyha-Luosto National Park and Safaris. You'll discover tucked-away gems like Korouoma Canyon and Kopara Reindeer Park. There's much more to do: take in the dramatic scenery at Auttikongas, Head underground at Syvasenvaara Fell, and look for gifts at Your Piece Of Finland. To see reviews, more things to do, where to stay, and more tourist information, you can read our Rovaniemi attractions planner. Linz, Austria to Rovaniemi is an approximately 11.5-hour flight. You can also drive. Due to the time zone difference, you'll lose 1 hour traveling from Linz to Rovaniemi. In September, daytime highs in Rovaniemi are 13°C, while nighttime lows are 6°C. Wrap up your sightseeing on the 8th (Sun) to allow time to take a train to Oulu. Oulu is a city and municipality of inhabitants in the region of Northern Ostrobothnia, Finland. 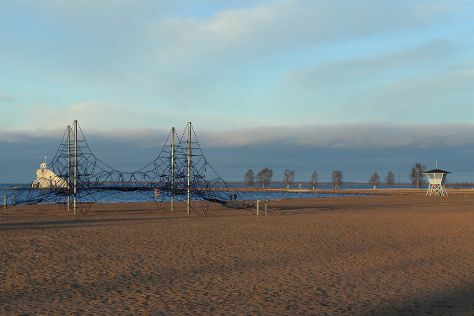 Start off your visit on the 9th (Mon): identify plant and animal life at Hupisaaret Park, then kick back and relax at Nallikari Beach, and then experience the excitement of Oulu Climbing Centre. Quickly create a custom-made itinerary for Oulu using our trip planner. You can take a train from Rovaniemi to Oulu in 2.5 hours. Other options are to take a bus; or drive. September in Oulu sees daily highs of 15°C and lows of 7°C at night. Finish your sightseeing early on the 9th (Mon) so you can travel to Helsinki. You'll discover tucked-away gems like Bellevue Beach and Nature & Wildlife Tours. Deepen your sense of the past at sights like Rock Church and Uspenskin Cathedral (Uspenskin Katedraali). Change things up with these side-trips from Helsinki: Porvoo (Cathedral of Porvoo & Porvoo Old Town), Sipoonkorven Kansallispuisto (in Vantaa) and Fagervik Museum (in Inkoo). There's much more to do: look for all kinds of wild species at Arboretum Mustila, pause for some serene contemplation at Helsinki Cathedral, take an in-depth tour of Seurasaari Island and Open-Air Museum, and steep yourself in history at Sea Fortress Suomenlinna. For ratings, maps, and more tourist information, you can read our Helsinki attractions planner. Getting from Oulu to Helsinki by flight takes about 3.5 hours. Other options: take a train; or drive. In September, daytime highs in Helsinki are 19°C, while nighttime lows are 8°C. Wrap up your sightseeing by early afternoon on the 14th (Sat) to allow enough time to travel back home.